Reference Drawing # 14 - The aileron cable pulley can be changed from a AN210-4A to the 1/2" smaller O.D. MS20220-2 if needed to allow the aileron cable to better line up with the wing strut. If you use the MS20220-2 pulley you will need to bush its I.D. to 1/4" or use a 5/16" bolt and drill out the pulley bracket. Inspect the line up of the aileron cable to the pulley, if not close to centered the bracket may need to be adjusted a little for proper line up. The following Engineering Notice is Non-Mandatory. Applies to the horizontal stabilizer/elevator outboard hinge location. Drawing #20 plans serial #453 and below. I have moved the outboard hinge to a new location 4 inches out towards the tip on drawing #20. This change is not required if you have finished fabricating your horizontal stabilizer. Elevator spar stress levels and stiffness are improved with this running change, also the overhung ratio is more closely matched to the rudder. Upper tail wires will increase in length by 3 1/2" and lower tail wires will increase in length by 3 3/4". Both of my Bearhawks have the original location and I do not plan to rework the tail feathers to make this change. I have had no indications of a problem to date. This change only improves the design. Refer to drawing #26 for plans serial numbers 376 and below. The T3 control link that works inside of the 1 1/8 X .049 torque tube does not have enough clearance to use standard attach hardware as shown in view B. Make the link as shown below so that standard hardware can be used at the cable attach locations. A 3/16" steel rivet will be need to be used at the control stick attach point. I made the rivet by cutting a AN23 clevis bolt to the 19/32" length behind the threads. If you have already made the link you can use the AN3 bolt at the cable end with a thin nut with Loc-Tite and or peen slightly (see photo). Another solution would be to make the .062 end brackets at an angle such that all the hardware works outside the 1 1/8 x .049 torque tube as shown above. Plans number 376 and up have this arrangement. If you would like a new drawing #26 please send $3 to cover printing & shipping cost. The Bearhawk I am building now will use the control stick as your plans show with the 3/16" steel rivet joint at the control stick attach point. See photo above. 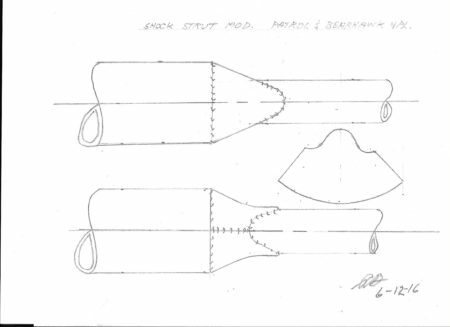 Reference drawings #12 and #14 for plans serial numbers 280 or below. 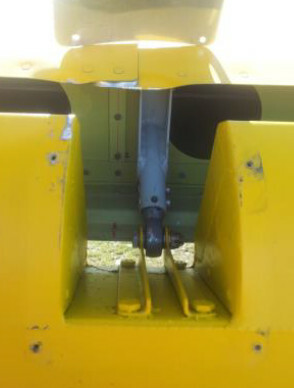 The inboard flap lever arm was shortened from 4-1/8" to 4" for clearance with the aileron cable. If you have completed this assembly you may remove up to 1/16" from the tip of the flap lever arm for clearance. 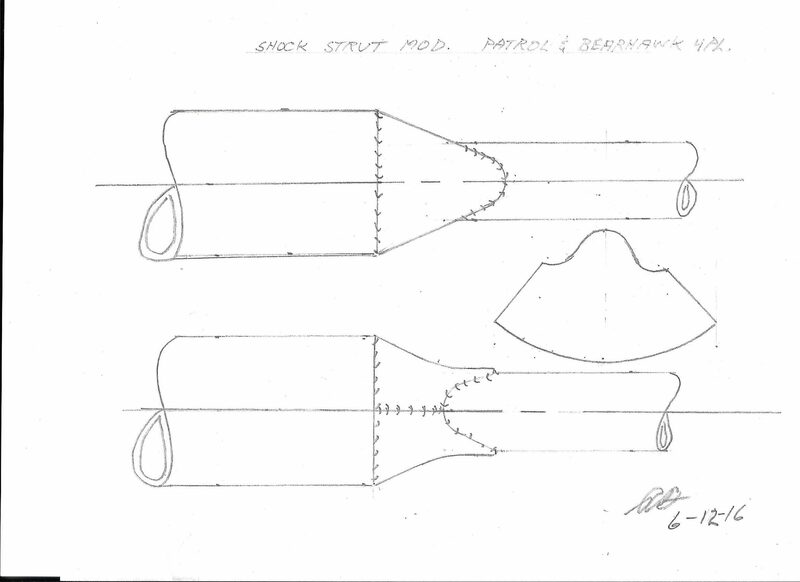 Refer to drawing # 19. Change the 3 7/8" dimension to 3 1/2" as shown in the drawing. This change will allow for more horizontal stabilizer adjustment range to accommodate various engine installations. Applies to any of the Bearhawk types that have the covers installed. Recently a Bearhawk 4-place had a flap retraction problem on one flap because the pocket cover plate jammed into the top wing skin, and would not allow the flap to retract. The plane was still flyable, but this problem needs to be addressed. FLAPS: On the top of the flaps the cover plate should only be deep enough to cover the gap from the flap spar to the back of the wing skin, about 1 ¼ inches, with the flap up. AILERONS: On the aileron the cover needs to be much deeper, so that with full down aileron, the front of the cover is still under the wing skin. Applies to Four Place Bearhawk, Kits Only. A few days ago, a customer had a failure of one horizontal stabilizer support struts in the air. Fortunately, the Bearhawk can fly without the strut on the front and he was able to land safely. Bob Barrows flew his Prototype I Bearhawk at first without the struts, but later decided that the additional safety of the struts merited installing them. Several years back there was a change in the design of the struts at the top where they bolt to the bottom of the leading edge tube of the horizontal stabilizers. The issue was fatigue from vibration caused cracking at the place where the streamline tubing was bent at an angle to mate up to the bottom of the horizontal stabs. At that time, a change was made to run fillet weld across the area where the bend was thereby adding material and strength to the area where there had been a problem. Also, a doubler washer was welded to the bottom of the bent part to reinforce the area where the attach bolt is. So since that time we have been aware of what vibration can do to the tail of the plane in general and theses struts in particular. The failure of this strut was in a different area. The “bolt” failed that is welded to the bottom of the strut to thread on the AN665 clevis end. The AN490 “bolt” failed where the threads ended. Two factors contributed to make this problem occur. First, the owner reports that the welding extended past the “shoulder” of the AN490 onto the threads thereby weakening them. In addition, this strut was a little short so the owner made a longer piece to use instead of the AN665 clevis end. This positioned the end of the threads further away from the attach point at the lower longeron making vibration worse. This was a one time occurrence that no one else has seen. It is possible that the AN490 had a manufacturing or material defect despite being a certified AN fitting. We are issuing this Service Notice as a precautionary measure. I have inspected five of the support struts – three I have on hand and the two on my Bearhawk. None have weld bead beyond the shoulder of the AN490. So it would appear that this might not be too prevalent on the parts out in the field. Please look at the picture included that shows the AN490 before welding. Where the threads transition to the shoulder is a little curved radius – it is not a sharp corner. Don't confuse this with weld bead. We ask you to do two things: inspect that lower part of the support struts to see if the weld bead extends onto the threads. If it does, the strut will need to be fixed. Also, Bob asks that at least 1/2” of threads be engaged into the AN665. Having the threads closer to the attach tab on the lower longeron diminishes vibration and potential fatigue. The crack on the strut that eventually failed started as a small crack and grew over time. So please give a thorough inspection to this part before next flight and during your preflight inspections. If you find that the weld bead extends onto the threads – or your struts are too short to get 1/2” thread engagement, please contact me to make arrangements to get your strut fixed. Bob has designed a fix that we will do for you if your struts are short.